On my Seacoast walks, I’ve been curious about a tower in the town of Rye. 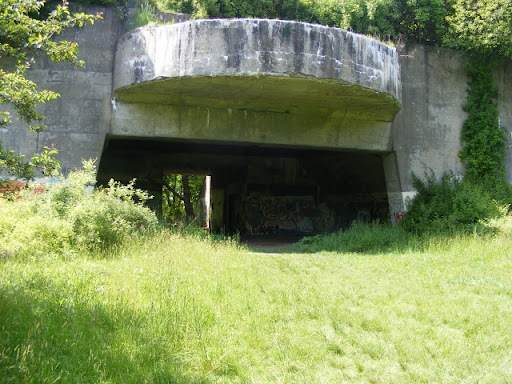 I recently learned that it’s a relic of WW2-era coastal defense, as with the old battery sites at nearby Odiorne Point State Park. It even has a name: Pulpit Rock Tower. 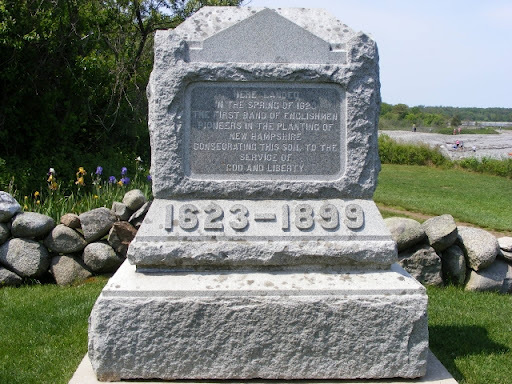 Now out of commission and owned by the state of New Hampshire, it’s closed to the public except for rare events – and I happened to stumble across one of those events, on what was probably the clearest day of the year. Well done, Friends of Pulpit Rock Tower. Odiorne Point State Park never gets old for me, in any season. I had planned a one-day “grand tour,” with a stop at Pawtuckaway for the fire tower then Odiorne Point for the beach and then Stratham Park for the observation tower. (Whew.) Eight hours, with three of them in the car. I’m glad I reconsidered. Odiorne Point was all I needed. This is the best piece of New Hampshire’s eighteen-or-so miles of Atlantic coastline. Those of you wanting a sandy beach & crowds can travel a few more miles south to Hampton. Odiorne Point is an altogether different experience. With a rocky shore, it’s not a big sunbathing destination. What is has instead are trails, a boat launch, a salt marsh, dense woods, a science museum (separate admission), and a few World War II-era gun emplacements (!). Check out the New Hampshire State Parks web page here for more information. 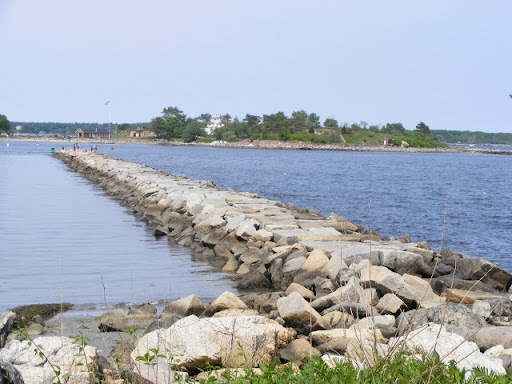 Located on Route 1-A in Rye, just south of Portsmouth & New Castle, Odiorne Point State Park has a $4-per-person admission fee whenever there’s an attendant on duty, as on this Memorial Day weekend. Pack a lunch & enjoy the view to the Isles of Shoals from the picnic area. 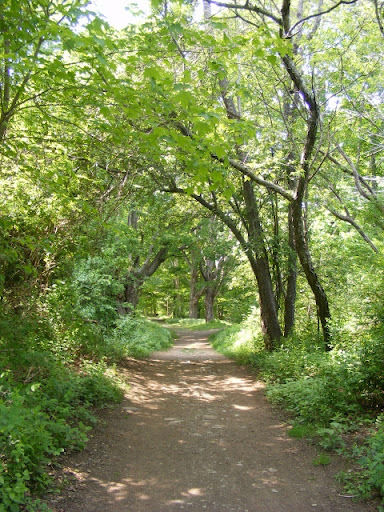 Bring bikes & strollers, since most of the paths are smooth & flat. The boat launch is a short distance north on Route 1-A from the main park entrance, if you want to bring your kayak. You’ll want a camera as well, especially if you’re a birdwatcher. Somewhat hobbled by a tweaked knee today, I walked a slow circuit from the main parking area out to Frost Point, then past one of the concrete gun emplacements to the bike path along 1-A, which led me back to the parking lot. Lots of families were out & about, but there was no sense of being crowded. I was probably the slowest person in the park, and no one seemed to mind. To get a sense of the different environments in this one small area, take an oceanside walk to feel the breeze & smell the salt air. Then walk away from the shore into the woods – and in just a minute, no more salt air. The fragrance of the woods is completely different. The shade will catch you by surprise, and so will the mosquitoes, unless you pack some bug repellent. Flowers both wild & cultivated are everywhere. 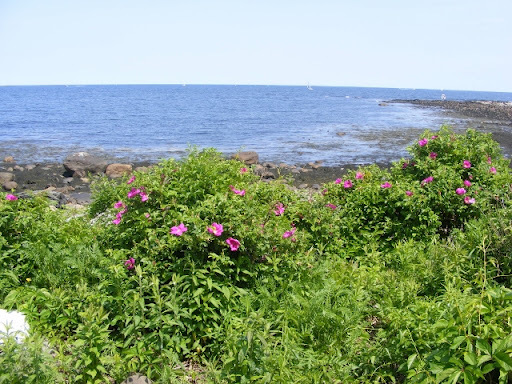 I’m fond of the wild roses that were blooming along the shore path. Clumps of iris stood near markers paying tribute to the park’s history. They’re not for picking, of course, but I have to admit I was tempted.